Our staff members generally hail from all over the country and from many walks of life. Many of them are seasoned veterans of the joys and travails of boats, boating, and boatbuilding, while others are warm, friendly faces doing their very best to make your stay with us a pleasant, comfortable one. From the School Director to our energetic kitchen, waterfront, shop, and office staff, each member possesses a strong commitment to a first-class program and the creation of a positive, safe environment for students and visitors alike. Above all, they enjoy sharing this “little piece of paradise” with all who stop by. The folks who administer WoodenBoat School believe that each student’s experience is of the utmost importance. From your very first communication with the School office to the completion of your course(s), they will work hard at meeting your needs and expectations. Originally from Philadelphia, Rich Hilsinger first arrived at WoodenBoat School as a student back in 1983, and he’s lived in Brooklin ever since. Rich managed the School shop for seven years and also enjoyed the opportunity to teach courses in kayak and small boat construction. Woodworking became a part of his life after college, and he’s dabbled in everything from house carpentry, restaurant and bar renovation, post-and-beam barn restoration, and cabinetry. The “boat bug” bit while Rich wintered in the Caribbean in the 1970’s. 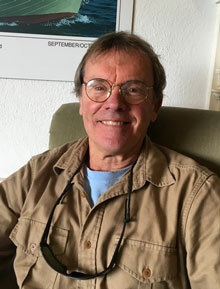 After sailing throughout the Caribbean and Europe for 3 years with the four-masted bark SEA CLOUD as ship’s carpenter, Rich returned to the U.S. and assisted on yacht deliveries; did boat repair; worked at North End Shipyard in Rockland and Brooklin Boat Yard; and purchased his own Crocker pocket cruiser MARTHA. He stepped into the position of WoodenBoat School Director in 1990 and has enjoyed bringing insight, energy, and full-time dedication to the well-known institution. When he is not involved with work at the School, Rich enjoys spending time with family and friends, sailing, gardening, reading, and cheering for all of Philadelphia’s professional sports teams. Kim Patten continues as Business Manager for her seventeenth year. Prior to joining WoodenBoat School, Kim spent five years as part of the WoodenBoat Store “team.” Originally from New York, she has spent every summer of her life in Maine, before making the move permanently after college. While summering in Maine, she spent her days sailing on Penobscot Bay. Kim and her husband Marvin keep busy working on their home and raising their daughter Riley. She enjoys the outdoors, sailing, skiing, and spending time with family and friends. Born and raised in Waterloo, Ontario, Canada, Greg Bauer came to boatbuilding as a third career later in life. Before the boatbuilding bug bit hard, he worked for six years as a design draftsman for a metal fabrication shop and for ten years as an accounting manager of an auto parts manufacturer. A couple of sailing experiences on the Maine windjammer ROSEWAY led Greg to the world of wooden boats, and he soon enrolled at The Landing School in Kennebunkport, Maine. After graduating from their boatbuilding program, Greg joined the school’s staff as a graduate teaching assistant. He then spent three years as a joiner with Bruckmann Yachts in Mississauga, Ontario. Greg moved to mid-coast Maine in the spring of 2002 and spent nine years with the boatbuilding crew at French & Webb in Belfast, Maine. In the spring of 2011 he joined the staff at WoodenBoat School as Waterfront Manager. In the fall of 2011 he started his own business, NB Woodworking, specializing in yacht joinery, custom cabinetry and fine woodworking.